Bromesedge, or Broomsedge as it is often called, is a member of the grass family. Its vegetative portion grows close to the ground producing light green, curly leaves. 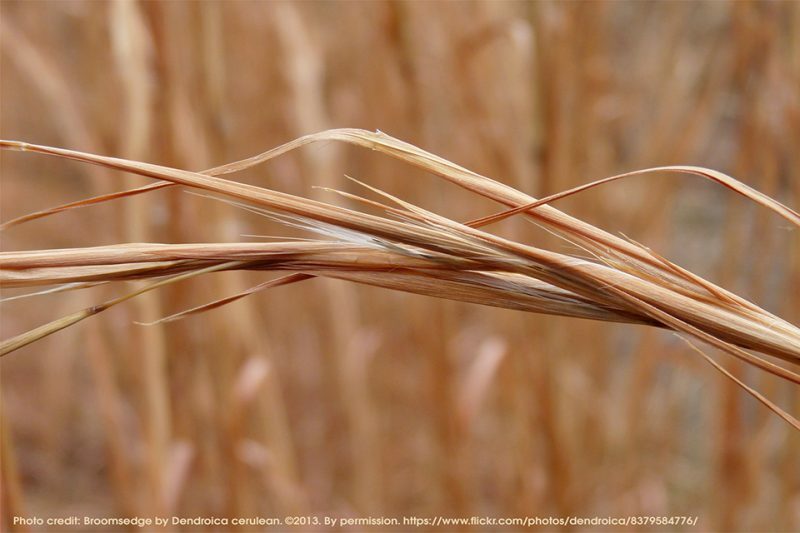 In the reproductive stage, Broomsedge produces a fibrous, golden stem that was often cut and bound together for use as a broom. However, its nutritive value as a forage is very low and grazing animals find it unpalatable. We were discussing this problem with a local farmer a couple of weeks ago who runs a mixed herd of Scottish Highland and Irish Dexter beef cattle on his 34-acre farm near Odessa, Missouri. Broomsedge is an opportunist. It capitalizes on situations of weakness in desirable forage crops. When a desirable plant is lost, it leaves a void in the canopy allowing more light to penetrate. This sets up the environment for Broomsedge to propagate and thrive. The condition that most favors Broomsedge is poor soil fertility. Nutrient deficient pastures, especially with low levels of phosphorous and acidic soils, pH (<5.5) are a detriment to desirable forages and at the same time, provide the conditions for Broomsedge to invade. Phosphorous is very important to the maintenance of legumes in the pasture. So the first step in winning the battle with Broomsedge is to address nutrient deficiencies in the soil. This begins with a basic soil test. Although the soil test will most likely show a Phosphorous deficiency, other mineral nutrients should not be ignored. Optimum soil fertility requires balancing the primary and secondary minerals. This is how we “nip it in the bud.” With the eleven primary and secondary minerals at optimum levels and ratios to each other, desirable plants will thrive and out-compete Broomsedge and remove the conditions favorable to its growth. If the budget is tight and you are unable to add all the minerals, begin with Calcium if it is required, and add the rest gradually over the next few years as recommended. Things are not always as they seem. A Phosphorous deficiency may not mean a lack of Phosphorous. When the mineral nutrients are out of balance, the availability of Phosphorous may be affected even though there may be plenty of it in the soil. A shortage of one nutrient may “tie up” several others. This possibility emphasizes the importance of a soil test. You must know where you are if you are to get where you want to go. We have nipped it in the bud by addressing soil fertility. So how do we “nip it before it buds?” Cattle may actively graze on the palatable, young Broomsedge vegetative growth occurring early in the season. Defoliation at this stage will reduce its vigor so early season grazing pressure can be part of the solution when Broomsedge is already a problem. On the other hand, inadequate defoliation pressure reduces stress on the Broomsedge and increases stress on desirable forage plants, giving Broomsedge the competitive advantage. Other methods that have been used as a means of controlling and removing Broomsedge have their caveats. Burning can improve the regrowth quality of forage but Broomsedge is a warm season grass not damaged by early spring fires. Repeated burning on cool season pastures will eventually reduce the desired plants. Any herbicide that would be effective against Broomsedge would also damage desirable plants. Targeted spot spraying may be possible but that would defeat the purpose of farming organically. Mowing is really not effective because by the time Broomsedge is high enough to mow, it has reached the reproductive stage. Mowing would just facilitate seed disbursement. Addressing soil fertility and evaluating grazing strategy are the most effective means of keeping Broomsedge out of the pasture and eliminating it when it becomes a problem. It took time for Broomsedge to gain a foothold and it will take time to get it under control. Optimizing soil fertility and patience will be rewarded with vigorous, nutrient-dense, Broomsedge-free forage.